Carpet 101 > How Often Should I Vacuum? We hear this question a lot. The best carpet or rug in the world won’t perform well if you don’t vacuum regularly. To get the most out of your soft surface flooring, it’s important to adopt a regular maintenance routine. No matter the product, you can extend your carpet’s life by vacuuming frequently and diligently. One of the biggest mistakes homeowners make is waiting to vacuum until the carpet looks dirty. 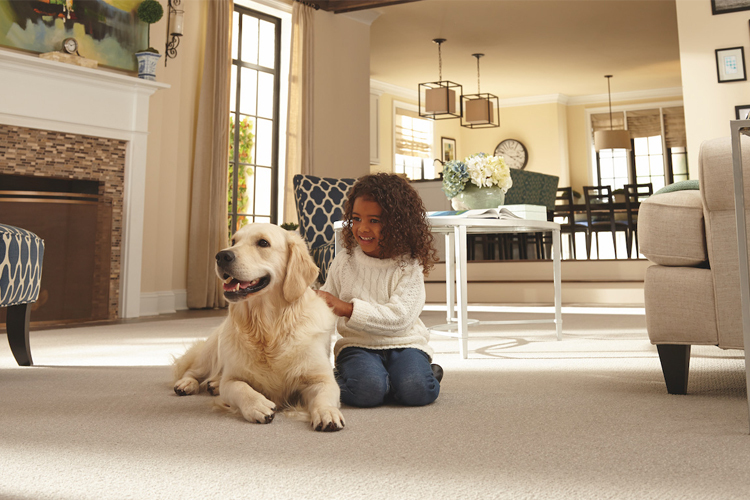 You won’t always notice the tiny soil particles that land on your carpet, and it’s most important to remove that soil when it’s on the surface of the carpet and not embedded in the fibers. When regular vacuuming is neglected, soil particles become embedded in the carpet fibers through normal use. Since most soil is gritty and abrasive, the particles will begin to damage the carpet fibers unless vacuumed regularly. This damage is the main reason carpets age prematurely, so don’t skip routine vacuuming just because your floor doesn’t look like it needs it. See our general recommendations below for keeping carpet and rugs clean and looking like new. Also consult the maintenance and care information provided by your flooring manufacturer for specific guidelines. Vacuum high traffic areas daily. Medium traffic areas should be vacuumed twice per week. Vacuum all areas at least once per week even if carpet or rug looks clean. Every 18 months, clean the carpets with professional hot water extraction to remove deeply embedded particles and oily dirt. Professional deep cleaning will also refresh the carpet’s texture and appearance. High traffic areas may require professional cleaning more often. Clean these areas as soon as they begin to show soil to stop dirt from spreading and to extend time between professional cleanings. Use vacuums and other equipment with the Carpet and Rug Institute Seal of Approval. Readjust the vacuum height for each flooring surface in your home. Setting too high above the surface will cause soil attraction to be weak, allowing gritty, heavier soil to stay in the flooring. Setting the vacuum too low could damage your carpet or rug by fraying the surface pile. To determine the optimal height setting, test the vacuum in an inconspicuous area, like a closet. Check the beater/brush bar regularly for burs or gouges that might damage your flooring. For thick loop, casual frieze, long pile or premium soft carpets and for hard surfaces, completely disengage the beater/brush bar or use a vacuum without a beater/brush bar. Ensure your vacuum has efficient airflow to avoid tight or sealed suction on the carpet's surface, which makes operating the machine difficult and may damage fibers. Check your vacuum cleaner bag regularly, and change it when it becomes half to two-thirds full. A full vacuum bag will cause the vacuum to clean less efficiently and less thoroughly.